FOR A CLEARER comprehension of the ease with which any pronounced change in the thinking also changes the structure of the physical body, and thus not only affects the health but the discernible characteristics of the form, it is necessary to understand more details of the electrical properties of colloids. Some of the physical characteristics, such as the blondness or brunetness and the general size of the bony structure, are expressions of thought cells within the astral form that are so stable in their organization that only a different manner of thinking carried out intensely and over a long period of time can have an appreciable effect upon them. But through the constant replacement of outworn tissues by materials which reach them in the colloidal state, other factors of the bodily form respond with great alacrity to any change of the inner thought structure which comprises the real character. Water is a chief ingredient of the bloodstream; and water carries the materials assimilated from food not only in solution but also in emulsion. Oil, or drops of fat, will not mix with water. To understand why, it is necessary to know that, according to late findings of material science, water in the liquid form consists of a mixture of inactive atoms and active atoms. The two atoms of hydrogen and the one atom of oxygen comprising a molecule of water, in the active molecules carry a positive electric charge on one end of the molecule and a negative charge on the other. Sugar is a carbohydrate which quickly enters the bloodstream. When it enters into solution with water, it is because the relatively large sugar molecules have electric charges sticking out of their sides. The active water molecules, because they have opposite charges of electricity on their ends like a bar magnet, are called polar molecules. Due to the large electrical charges of the sugar molecules, these rapidly moving polar molecules of water, also carrying electrical charges, through the attractions of their fields for the fields of the sugar molecules, quickly pull these molecules of sugar away from each other and the sugar thus becomes dissolved in the water. The hotter the water, the more quickly the sugar dissolves, because the active water molecules are moving faster and more readily contact the fields about the sugar molecules. Not all substances possess polarized molecules. Fats and oils, for instance, whether taken into the system as such or converted from carbohydrates, have non polarized molecules in which the positive and negative charges are so related that they neutralize each other. Carrying no appreciable charge for the fields of the water molecules to act upon, the water molecules cannot mix with them, cannot tear them from each other and cause them to dissolve. There are other substances, however, unlike water, part of whose molecules have a charge on either end, and unlike sugar, with charges on the sides of its molecules, and unlike oils whose molecules are non polar. These substances have an electric charge at one end of the molecule, but the other end of the molecule is electrically neutral. Hence when they are brought into contact with the active, and therefore charged, molecules of water, if they are light enough to float the charged ends of their molecules stick down into the water, due to the attraction of the fields on the end of the water molecules. As the charged ends are down, this means that the neutral ends are up. And the attractive force of the down-pointing ends causes the substance to spread out as a film so that by occupying as large an area of contact as possible with the water more molecules can respond to this attraction between the two sets of molecules. Soap is such a substance, and this action of the fields of the water molecules on the fields of the soap molecules explains how a soap bubble is formed, and why, compared to its thinness, it is so very strong. It is strong because of the power of the fields of the two types of molecules composing it to attract each other. Now as such substances as soap have one neutral end, when they are placed in oil, instead of water, their charged ends are not attracted to the non-polar molecules of the oil, but turn away from them, so that they float on the oil with the charged ends up. Then if water is added and the mixture is well shaken, the oil droplets are diffused throughout the water and we have what is called an emulsion. The oil is not dissolved in the water, merely disseminated through it in a finely divided state. But it tends to retain this state because the soap, or similar substance, on the surface of each drop of oil, has the neutral end of each molecule sticking down into the neutral oil, and the charged end sticking out into the water and holding to the water molecule by the attraction between their mutual fields. When the oil drops are very small, such as they are when taken into the human bloodstream in the process of assimilating butter, animal fat and vegetable oils, or the carbohydrates after they have been converted into fat, instead of calling it an emulsion, it is said to be in the colloidal state. And in the colloidal state these drops of oil which become fat, and the particles of protein which become muscle, are capable of carrying on their surfaces electric charges which are exceedingly large in proportion to the mass of the particles carrying them. This means that the building and replacement material of the physical body, at the time it is being incorporated into the physical structure, is in that state which enables it to carry heavy electrical charges which permit it to be moved about and manipulated with the greatest facility by the electromagnetic energies generated in the nervous system. 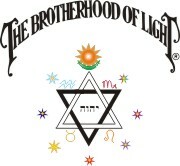 It is by means of these electromagnetic energies that the orders of the brain to the organs are delivered, that the thoughts we think reach the astral form, that we are able to remember past events by bringing them through from the soul, and that all control of our minds over our bodies is carried out. The thought cells and thought structures of the soul are at all times, while physical life lasts, in intimate contact with these electromagnetic energies generated by the nervous system. Through them they exercise a constant influence on the distribution of all materials furnished through the digestion and assimilation of food. And this influence, which is exerted through the electromagnetic energies of the nervous system acting upon the electrically charged particles of the physical materials being incorporated into the body, is toward building just such a physical form—including both the harmonies and the discords which express as health and disease—as constitutes an exact replica of the thought structure, or character, of the soul. In addition to noting the general form of the body—whether it is bony, muscular, fat, vivacious or mental, a first glance also gives an impression of the contour of the face. When we look at some persons the impression we get of their faces is of extreme pointedness, others impress us with the incurving quality of the countenance, and still others present faces in which all the lines seem straight and abrupt. 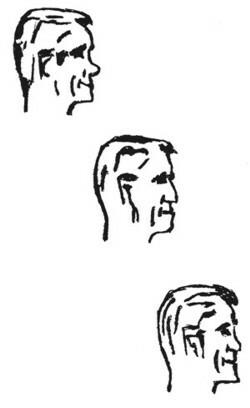 These facial shapes, even as are the shapes of the head and body, are the expression of the internal mental forces that constitute the character. As true expressions of character they reveal to the discerning, only in less degree than do the acts, the qualities of character of the person possessing them. Faces may aptly be classified into two shapes, and a third which is intermediate, even as nature’s forces may likewise be classified into centrifugal forces, centripetal forces, and those acted upon by both of these and consequently intermediate between them. A centrifugal force is one which tends to move away from the center. It corresponds to the out-curving, or convex face. A centripetal force is one which moves toward the center. It corresponds to the in-curving, or concave, face. It is the centrifugal motion of the planets—their speeds—which keeps them from falling into the sun. It is the centripetal force, expressing as gravitation, that keeps the planets from flying from their orbits into outer space. It is the balance between the speeds of the planets and the force of gravitation that holds them to their orbits. And it is the balance between the speeds of the out-curving faces, and the more thorough, painstaking in-curving faces, that keeps civilization from dashing into exploits and ventures for which it is not yet prepared. For speed, look to the person whose features have an outward curve. For carefulness, look to the dish-faced person, the one whose features curve inward. For a useful combination of these two extreme qualities, look to the person whose features are straight, curving neither inward nor outward. Some people, however, are quick to think and slow to act. Others are quick to act and slow to relinquish their endeavor. Then again, some are quick to speak, and slow to act upon what they promise, while others are slow to speak, but follow speech quickly with action. These and other combinations, are all revealed to the discerning in a single glance at the profile. The profile, for practical purposes, may be divided into four distinct regions. 1. The forehead, embracing that region from the eyes up. 2. The nose. 3. The mouth. 4. The chin. The shape of the forehead is an index to the rapidity of thought. The shape of the nose is an index to the rapidity of action. The shape of the mouth is an index to the rapidity of speech. And the shape of the chin is an index to the rapidity with which thoughts, actions, and speech are relinquished. It is an index to the general determination and tenacity. A person’s capacity for intelligence is not to be determined by the slope of the forehead, but by the length of the head from the ears forward. The kind of intelligence that a person possesses, though, may so be determined. A receding forehead is not the sign of a small intellect, it is the mark of a person who thinks quickly, and who thinks almost exclusively about practical things. What he wants is results. He cares nothing whatever about theories. He demands action. He may be a scientist or he may be a manual worker, depending upon the length of his head and other things, but he is a “low brow,” because he demands that things be demonstrated. He takes no stock in things that have not a practical value here and now. And the more sloping his brow the faster he thinks. He does not bother with meditation and reflection, but draws his conclusions instantly from the evidence at hand and lets it go at that. The convex, or receding forehead is an indication of quick and accurate powers of observation. Such a person sees all that goes on about him, and instantly draws inferences from them. He is keenly interested in how things are done, not from a theoretical standpoint but from a visual advantage. He wishes actually to see all the links in the operation, and just how one process influences the next process. He is not content to be told about these things, he wishes to behold them with his own eyes. And seeing them, he remembers each step and object in its proper relation to other steps and objects. Therefore the best way to interest and convince such a person, is to give him an actual demonstration. If you cannot show him the thing itself, at least show him numerous pictures; so that he will be able to visualize the proposition as a concrete reality. Better still, if it is something of a nature that can so be examined, permit him to feel it, to smell it, and if it has taste, to taste it. Appeal to his mind through just as many of the physical senses as possible; for he depends upon his physical senses for information rather than upon his reason. Life offers innumerable opportunities for the slow but careful thinker who can reason and draw conclusions correctly. There are other places—anything from driving a motor through the traffic to a political caucus—where quickness of thought is a better asset than precision. The concave forehead is not suited to quick thinking, and should seek a vocation where correct thinking is better than fast thinking. Where fast thinking is requisite, such is the place for the convex brow. The convex forehead indicates that the Intellectual thought elements are not pronouncedly associated with the Safety thought elements insofar as they influence the tendency for reflection. In its evolutionary past the soul has met the requirements of environment by a quick perception of relations. This is indicated in the birth chart by lack of pronounced associations between the planets Mercury and Saturn. The Keyword for the receding forehead is PERCEPTION. To make a successful impression with such a person, and keep up his interest, it is essential that things are not permitted to drag. He thinks quickly, and is mind passes from one thing to another, and unless kept occupied it will wander to something else. Give him all the concrete facts possible, but do not argue with him. Show him all there is to be shown. And do it quickly. By the time this has been done he will have drawn his conclusions, and if there is a decision to make he will have made it. Such a person will be little interested in the history of the enterprise, or the romance attached to its development but if you can show him that something is actually being done, and that there are results in sight, he will have confidence in it, and if he can see his way clearly to do so he will make a favorable decision toward it. The person with a bulging forehead represents the opposite, or concave type. His head is built for reflection. Everything he does is duly weighed and every detail thought out far in advance. He depends upon reason to apprise him of things. You may sit in his office and explain the working of a distant plant to him, show him a few maps, tell him the history of the enterprise, just how each process follows another, how, perhaps, something is manufactured, and the various hands it must pass through before it reaches the consumer, and he will be interested and impressed. You do not need to take him to the plant and show him through it, and permit him to handle the product in its various stages of construction. Such would be the proper course with the convex forehead type. But the concave forehead is a dreamer. He can see it mentally as you describe it. He visualizes it in his imagination. Then he thinks things out at leisure. He is not to be hurried. He must be given time to decide, and as many reasons “why and wherefore” as possible. His questions must be answered and his objections met. The concave forehead indicates that the Safety thought elements have been very strongly organized in association with the Intellectual thought elements. In its evolutionary past the soul has met the requirements of environment not so much by the celerity with which states of consciousness have responded to outside influences, as by the exactness with which the correct response was given. In the birth chart this is indicated by a strong association between the planets Mercury and Saturn. The Keyword for the bulging forehead is REFLECTION. The person with the concave forehead is the one that does most of the planning in the world. He is given to thinking of things and carefully working out means of accomplishment. His mental processes are slow and deliberate, but he can handle abstract notions in a way that will enable him to arrive at correct conclusions. These conclusions are sometimes scoffed at by the convex type, because they represent something that has never been attempted before, or represent methods that are different from common usage. I have so far been dealing with extreme cases. The majority of foreheads are somewhere between these two extremes. The forehead that is perpendicular from the eyes up—the straight forehead—is just midway between the two extremes. 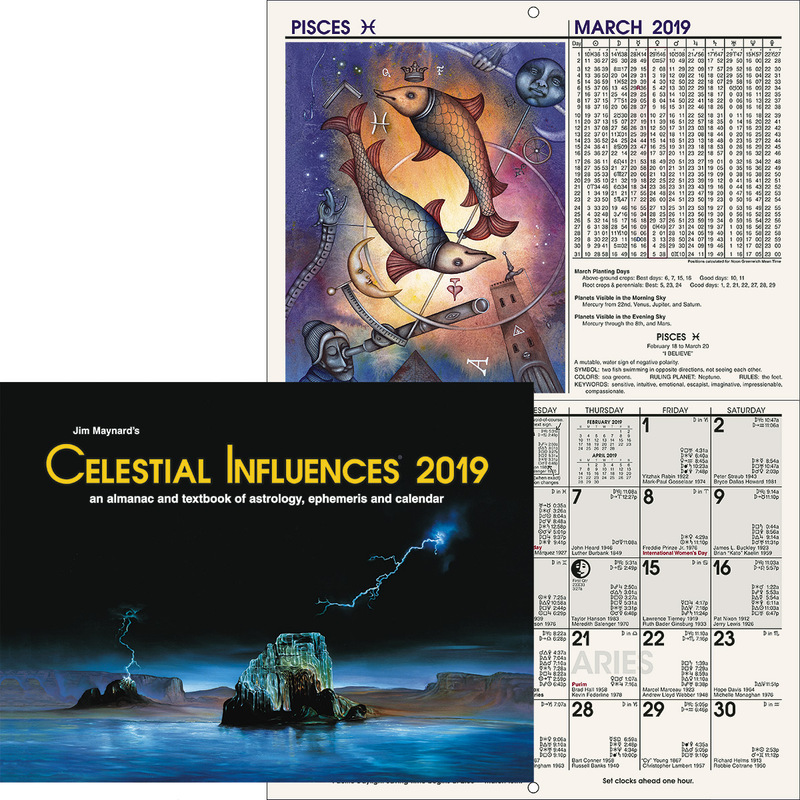 There is not the unusually strong and pronounced association between the Intellectual thought elements and the Safety thought elements in such a person’s astral constitution; nor are Mercury and Saturn so closely linked in his birth chart as to excite comment. The faculties of perception and reflection are just about equally active. As a consequence he sees and then reflects upon what he has seen. His mental processes are neither rapid nor slow. He is to an extent practical, yet also perceives the value of theories and plans. He, therefore, is regarded by his fellows as a level-headed man, one whose judgment may usually be trusted. In all things he keeps away from extremes, and prides himself on being sensible. He is not so set on getting things done as is the convex forehead, yet practical accomplishment has considerable appeal to him. He is not so desirous of having time for meditation and dreaming as the extreme concave forehead, yet anything that will give him some time for thought, and such theoretical and explanatory matters as are essential to make the situation clear, all have a certain amount of appeal. He is not in too big a hurry to make a decision, yet too much time spent in talking about a proposition seems a waste of time to him. He wants what facts are at hand. He wants to see what is readily seen. He desires also a reasonable amount of explanation. It must then appeal to his “common sense” if he is to make a favorable decision. Thinking, of course, is man’s greatest asset. And because he thinks moderately fast and at the same time organizes his thoughts somewhat carefully as causes and effects, as reasons and results, the person with a straight brow tends to represent the all-around man. He thinks quickly enough so that he does not find it difficult to drive his car through the thickest traffic in the city, yet he thinks slowly and carefully enough that a reasonable plan, even though it has never been tried before, gains his attention, and if it has merit he will become a party to it. He has enough of the convex brow about him that he can understand science, engineering, mathematics, manual arts, surgery, agriculture and the occult sciences; and he has enough of the concave brow about him that he also can understand philosophy, theology, sociology, political economy, history and mysticism. He has not the capacity for specialization that either extreme has, but neither has he their limitations. Perception and Reflection are balanced. Now let us apply our principle—that the out-curving, or centrifugal outline is the form indicating speed and that the in-curving, or centripetal outline is the form indicating slowness—to the nose. But first let us inquire about the function of the nose. The nose is the organ through which air customarily reaches the lungs. Its size and shape, undoubtedly, have been determined by the requirements of environment. A large nose indicates a copious air supply. A copious air supply, in turn, indicates complete and rapid oxygenation of the blood. Movement depends upon oxygenation of the blood. That is why a person pants when running—speeding up the activity demands an increased supply of oxygen. There must be sufficient draught that the fuel in the human machine may undergo combustion. Large combustion is indicated by a large nose, that is, a nose with large nostrils. Large combustion implies the capacity for much movement and rapid movement. The air supply furnished through the nose is not dependent upon the length of the nose. A very short nose may furnish quite as much air as a very long one. What, then, is the meaning of a long nose? It is the function of the nose not only to furnish an air supply, but to regulate its temperature so that it will not unduly chill the tissues of the lungs. In its passage through a very short nose the temperature of the air is little changed. But in passing through a very long nose the air tends to acquire the temperature of the passage through which it flows. In the tropics there is little need to change the temperature of the air before it reaches the lungs. Hence we find the negroid races whose home since time immemorial has been in the tropics, with short flat noses. We find also that the requirements of life in the tropics do not demand long periods of sustained activity. Short periods of activity are followed by periods of rest. A short nose indicates inability for sustained activity. Peoples whose homes for thousands of years have been in the North have longer noses. The winter atmosphere must be cooled before it reaches the tender tissue of the lungs. And the requirements of life in the North, where there are long periods during which there is no vegetable food and man in the past has been largely dependent on the chase, have been such that sustained effort was essential to survival. A long nose, therefore, indicates a capacity for sustained activity. It will be seen, now, that as activity is so closely dependent upon the air supply, and that as the amount of air supply may be judged by the nose, that the size and shape of the nose is a gauge to the person’s inclination and capacity for activity. It will also be obvious that a sway-backed nose—one that is concave, or in-curving—no matter how long it is, cannot convey much air to the lungs. It indicates that the nasal passages are narrow and restricted. The air supply of such a person is deficient. And as a result the person’s movements are slowed down. If he has a convex forehead he will think quickly, but will delay about acting. He is slow to act. He tends to procrastinate. If the forehead is concave also, he both thinks slowly and acts slowly. The upturned nose indicates a tendency to deliberation where physical activity is concerned. If you want a thing done promptly, do not depend upon a person with a sway-backed nose to do it. He may both think fast and talk fast, but in his physical movements he is slow and painstaking. He may be a good workman, but he is not a fast one. The out-curving nose, on the other hand, indicates copious nasal passages, and an abundant air supply. The Roman nose, the eagle-beaked nose, the Jewish nose, as types are out-curving, and they indicate expedition in movement. The person to get something done quickly is the person with the large out-curving nose. He may think fast, or think slow, according to the shape of his forehead, but he acts immediately he has made up his mind. He either does a thing now as soon as he thinks about it, or he decides not to do it and turns to something else. His mental processes are followed by the execution of his thoughts instantly in action. The straight nose—the Grecian nose—indicates a compromise between the person who acts swiftly upon the thought, and one who acts very slowly after deciding to do so. Such a person has not the fault of acting first and thinking about it afterward, as does the person with a convex nose when he is also a slow thinker. He is less impulsive. Yet he does not make so many good plans and then fail to carry them out as does the person with the extremely concave nose. His motions are moderately speedy, and he puts his ideas into action with moderate promptness. 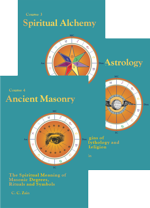 Combustion, whether in a stove in the home, underneath the boiler of an engine, in the cylinder of a gasoline motor, or in the tissues of the human body, is a process of oxygenation, and in astrology is ruled by the planet Mars. The nose, then, is a very good index to the prominence of the Aggressive thought cells in man’s constitution and the planet Mars in the birth chart, insofar as they influence rapidity of movement. The nose with large nostrils indicates large combustion, hence physical rapidity. A broad flat nose may also indicate a copious air supply accompanied by physical activity. Usually, however, the large air supply is furnished by an out-curving nose. The large flat nose being short also, even when indicating speed, shows that the speed will be short lived. The large out-curving long nose indicates both speed and the ability to maintain it. It may well belong to an aggressive and dominant person. The merchant who goes forth from his shop and takes the pedestrian by the arm and persuades him to come in and buy something has a long out-curving hooked nose. The most aggressive business men in the world—those that dominate commerce and industry—have this type of nose. But the sway-backed nose indicates lack of strongly organized Aggressive thought cells in the astral body. The planet Mars in the birth chart does not strongly influence physical activity. The straight nose indicates that Mars is moderately strong in the birth chart as associated with physical actions. If the straight nose is short there is an aversion to long periods of physical work. If the straight nose is long, long periods of physical work can be sustained without much fatigue. Some people think before they speak, and others speak before they think. Still other people act first and talk about it afterwards if at all, and yet others talk about what they are going to do and then take their time in doing it or fail completely to act. This readiness of speech is determined by the contour of the mouth in relation to the rest of the face. The mouth may tend to project in relation to the balance of the face, or it may tend to set somewhat inward from what otherwise would be straight facial lines. In considering the mouth contour the lips should be included in the survey. It is the shape of the mouth as a whole insofar as it determines whether it is an out-curving or an in-curving or a straight mouth that we are here trying to decide. We are not now noticing whether the corners of the mouth turn up or down, if it is a cupid bow, a straight line, or crooked outline. 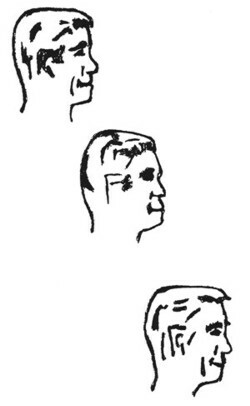 To know if a person speaks quickly or slowly relative to his thoughts and actions it is but necessary to observe if the contour of the mouth is out-curving or in-curving. The out-curving mouth is the quick talker. Whatever passes through his mind he tends to blurt out without thinking very much about how it will affect his audience. People with protruding mouths are incessant talkers and are never at a loss to find innumerable things to talk about. They may, or may not, talk well, and what they talk about may, or may not be important or interesting; but they talk nevertheless. And it takes little encouragement to start them talking. The in-curving mouth is a deliberate talker. When called upon to talk he may, or may not, talk well, and what he talks about may, or may not, be important or interesting, but it takes considerable provocation to get him talking, and he talks slowly and likes to think things out before speaking about them. In the extreme type he thinks things out and then never reveals his conclusions except in his actions. If his mouth is in-curving to the extent of appearing to hold in his words, you may be sure he is what is known as closemouthed. A secret that would be revealed by a person with a projecting mouth to the first person met is quite safe for all time with the person with the decidedly in-curving mouth. In astrology the Intellectual thought elements are governed by the planet Mercury, and this same planet governs speech. 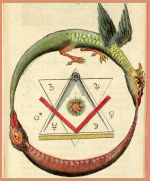 When the intellectual thought elements are organized in the astral body through past experiences insofar as they influence speech closely in association with the Safety thought elements ruled by Saturn, we have the in-curving mouth. The less of this Saturn influence as affecting speech, and the more of the Mars influence as affecting speech, the latter being denoted by Mercury being associated with Mars where speech is concerned, the more out-curving does the mouth become. The careful talker has the in-curving mouth. The impulsive talker has the out-curving mouth But whether the things talked about have value cannot be determined by the mouth, but by the head as indicating the trend and capacity of intelligence. The mouth but indicates one of the several avenues of expression of intelligence, and indicates the readiness with which the thoughts manifest through this avenue. It is an erroneous impression held by many that a person with a receding chin lacks in aggressive qualities and is slow to resent injury. The person with a receding chin is as quick to fight as the one with the protruding jaw, but he is not likely to fight so long. A study of the skulls of the cave men of the past shows that their heads were not as long from the ears forward as modern man’s, and also that their chins were more receding. As primitive man advanced in intelligence two things were apparent in the proportions of his head. The head from the ears forward became longer, and the jaw became less receding. This does not imply that all men a hundred thousand years ago had heads less developed than modern man. It means that however developed some men of that day were, we have the remains of other men who have since become extinct who were more closely related in structure to the lower animals. And these men, such as the Trinil Man, the Heidelburg Man, the Neanderthal Man, and the Dawn Man, as do the apes, had less in the way of chin development than modern man. No one will say that a gorilla is less aggressive than modern man, or that the ancient extinct men just mentioned were less ferocious than moderns. They did lack, however, one trait that next to intelligence has been of utmost importance to man in his evolution, and that is the ability to follow out a predetermined line of conduct. To follow out some plan once it is made and not be deterred from it even though it is disagreeable, and even though many interruptions come, and in spite of many incidents that tend to divert the attention elsewhere is the acquisition of highly developed humanity. Such ability is indicated by a concave, or well-developed chin. The Cro-Magnon, another ancient type of man, coming perhaps from Atlantis to rout the cave men and supplant them, not only had a good skull denoting intelligence in high degree, but he had a good chin, signifying that he would not be diverted from his purpose. He had will and determination. He overcame the people with receding or convex, chins that lived in Europe before his arrival. It is usually recognized that a receding chin denotes a weak character. And this is correct. But the weakness does not reside in inability to act with great force—for some of the ancient men mentioned were far superior physically to any living men of today—but in the inability to maintain fixity of purpose. The receding chin indicates changeableness, and if extreme it denotes a fickle person, one who does not know his mind from one day to the next. On the other hand, the person with a chin that protrudes extremely never knows when to let go either of an idea or of a project. He is consequently lacking in adaptability. When he gets a notion in his mind he holds to that notion, and is quite fixed in it. He becomes lacking in receptivity. It is quite as valuable to know when to give up an old manner of doing something, or to acknowledge a loss and forget it without, if it is a financial matter, throwing good money after bad, as it is to maintain a firm front when necessary. The strength of the Power thought cells in the astral body, as influencing Will and Determination, is shown by the chin. If the chin is prominent, or concave, it indicates that the Power thought cells have a prominent influence in this direction. If the chin is receding, or convex, it indicates that they do not externalize strongly in this direction. Astrologically, the prominent chin indicates that the Sun in the birth chart is powerful as affecting stability and determination, and the receding chin that the Sun has little influence in this direction. If your adversary has a prominent chin, you may be sure there will be a long struggle. To convince such a person, do not argue with him, but lead him to believe he desired in the first place to do as you suggest. He is inclined to be set in his likes and dislikes, in his opinions, and in his way of doing things. The Keyword for the prominent chin is DETERMINATION. The straight chin is a combination, or happy medium, between the two extremes. Such a person has considerable determination, but also yields when it seems advantageous to do so. The receding chin indicates a trait of unreliability. If you have an important piece of work to have done and there are many obstacles in the way of its accomplishment do not entrust it to a person with a receding chin. For a short time he may put up an excellent struggle, or work very hard, but he soon loses interest and becomes discouraged when confronted with difficulties. It is hard to discourage a person with a prominent chin to a point where he gives up. But the receding chin relinquishes its object and its plans readily. The Keyword for the receding chin is VACILLATION. Now the gorilla, with a receding chin, may be quite as pugnacious as the bull dog with a protruding chin. The gorilla is faster, although he does not hold on so long. So in men also, the amount of pugnacity cannot be determined from an inspection of the chin. But it may be determined by looking at the jaw. The jaw of the fighter drops well down below the ear, and where it turns forward there is a tendency to form a right angle. He has a strong jaw. It shows width, and angularity, and muscular power. The person with a narrow jaw, which slopes from the ear forward in a mild rounded curve is not naturally pugnacious. But you can get a quarrel or a fight from the man with a strong square jaw any time you desire it, and on short notice. For fighting quality do not look at the chin, but at the angle of the jaw. The Keyword for the deep angular jaw is PUGNACITY. The Aggressive thought cells in the square-jawed person’s astral body have in the past been organized through repeated conflicts with antagonists, and this is indicated in the birth chart by the planet Mars exerting a dominant influence over the personality. There is still another matter of considerable importance in instantaneous character reading. It is to determine whether a person naturally is coarse and rough, or is sensitive and refined. The coarse rough-textured person does not do well in an environment requiring tact, delicacy, fine appreciation of values and an artistic viewpoint. Also, on the other hand, the refined, sensitive person always has a hard time in rough, uncouth and harsh surroundings. Sensitiveness and refinement are not merely a matter of education. They are inherent in the character, and manifest in the texture of the body. Sensitiveness and refinement indicates that the Social thought cells have been prominently organized within the astral body in such a way as to manifest through the character. This signifies that the planet Venus in some manner is closely and strongly influencing the personality in the birth chart. To judge of the natural tendency toward refinement, first observe the hair. Very fine hair has a silky quality, and usually lies straight. Curly, or wavy hair, is usually coarser. Some very coarse hair, however, like that of the American Indian, is quite straight. This quality of fineness of the hair may best be learned by comparing the texture of different persons’ hair. Fine hair is one indication of a refined and sensitive nature. In astrology the hair is ruled by Venus, the planet that also rules refinement. The planet Venus also rules the skin. Therefore, we may look to the texture of the skin as an index to the prominence of Venus and the Social thought cells as influencing refinement. A soft, close textured, velvety skin is one indication of refinement in character. Coarse hair, and coarse, hard, or thick skin indicates that the Social thought cells have been but slightly organized to soften the tones of the character, and that there is little appreciation of the finer and more artistic things in life. Small hands and feet, and delicate, or finely chiseled features are other indications of refinement. Large hands and feet and coarse features indicate strength rather than taste and artistic quality. Not only is the refined person uncomfortable in a rough or harsh environment, but he will enjoy numerous things that the coarse person will care nothing at all about. Consequently in pleasing or persuading the coarse person quite the opposite method must be used to that employed to gain the attention and interest of the refined person. The refined person, if an employer, will require the place of work or business to be kept clean, he will require that the employees dress neatly, and that there is an artistic touch whenever possible. The coarse employer will care little about these things. He will care more about the amount of work being done and the immediate financial returns. Further, the fine man expects quality in all he buys, in his own work, and in the work of his employees. The coarse man demands quantity and utility rather than art and quality. In entertaining the coarse man do not try too much for delicacy of surroundings, or for finer artistic effects. He will not mind if the conversation becomes boisterous, or if jokes are told that are none too elevating. He will like good food, but it does not need to be served delicately. Rich food in abundance pleases him. But the fine man is repelled by boisterous conduct by unseemly jokes or language, by ugliness of any kind. He enjoys artistic surroundings, likes his food served daintily, even if there is none too much of it, and expects quality to be present in whatever form of entertainment is offered. The coarse man may enjoy the vaudeville, but the fine man will take greater pleasure at the opera. To interest the fine person, do not offend by loud talking. He likes a soft, well-modulated voice. The more beauty and excellence of quality are emphasized the better, and if it can be done in nice language it will be so much the more effective. To interest the coarse person, talk vigorously, and to the point. The fine man will understand subtleties and suggestions, but the coarse man needs to be told in plain, straight, forceful language. It is the only kind of persuasion he understands. Too much familiarity may offend the fine man, but the coarse man likes to be slapped on the back and observe heartiness and freedom in the conduct. Slang will not displease him, but is repugnant to the fine man. To persuade the coarse man, emphasize the elements of popularity, show, utility, volume, and strength. These are the things that appeal to him. He likes contrast in colors, and showiness in his clothes. But the fine man takes to less conspicuous styles and to modest shades of color. The fine man is apt to be touchy and easily offended. The coarse man, although if once offended he will resent it more vigorously, is not apt to get insulted without adequate cause. The fine man likes praise and flattery quite as much as the coarse man, or even more, but it must be more carefully veiled. Anything crude repels him. But the coarse man may be praised to his face, and in generous terms, without being offended, if this praise is not wholly unwarranted. It is a mistake for the coarse man to try to handle or work with fine materials, or to be brought into contact with fine people, or to be compelled to live in delicately modeled surroundings. He is ill at ease here. He enjoys cleanliness, but respects utility and homeliness more than beauty. The coarse man likes to deal in coarse, rough materials, he likes to associate with other coarse persons, and he knows how to get along with them. A coarse foreman, by his forceful tactics, is able to handle a crew of coarse workmen, where a finer man would fail utterly. Coarse workmen have a contempt for the refined foreman. On the other hand, the coarse salesman, by his mannerisms tends to repel the refined purchaser. Refined workmen look upon a coarse foreman with disgust. They feel immensely superior to him. So where the handling or dealing with fine materials are concerned, such as textile fabrics, jewelry, watchmaking, or delicate work of any kind, the fine man should have preference. The tradition of the “bull in the china shop” has direct application here. People are not only fine or coarse, they are also hard or soft or elastic. Of course, broadly speaking the typical hard man is of the bony type, the typical soft man is of the fat type, and the typical elastic man is of the vivacious type But in addition to the general type it is often worthwhile to note the quality of the flesh. It will be found that there is also a quality in the character of the individual that corresponds to it. The person with very hard firm flesh tends to be hard and firm in his thinking and his acting. He is truly a hard-fisted man. He cannot be moved by sympathy, or driven by force. The appeal to which he responds is self-interest and utility. There is little use to talk about the beautiful, or the humanitarian, or of sentiment to the hard man. He believes in justice. He believes in “an eye for an eye, and a tooth for a tooth.” He dislikes discipline, and drives ahead to his objective with little regard for people’s feelings. Show him how he will gain by some transaction and he is at once interested. This is the chief avenue of appeal to him. The person with very soft flesh needs an appeal of almost the opposite nature to arouse his interest. An appeal to his sense of ease, or to pleasure, interests him. Unlike the hard man, he is easy to convince, but tends to be unconvinced just as readily. He would rather agree with you than take the trouble to argue. He likes luxury and idleness and tends to self-indulgence in all ways. He has not the endurance of the hard man, cannot tolerate hardships, and while sympathetic, his feelings in any direction are short lived. If you wish a soft person to do something, make it as easy for him as possible. The person whose flesh is neither very hard nor very soft, but is exceedingly elastic, tends also to have an elastic quality in his character. In appealing to him do not emphasize its utility as you would to the hard man, or to the ease with which it can be done and the luxury which may be expected to follow, but to the love of accomplishment. The driving power of the elastic man is the love of doing something noteworthy. He is very adaptable and progressive and tends to put “pep” into all he does and to communicate this enthusiasm to his associates. The new and the original and the unique interest him. He wants something worthwhile to do, and liberty of action to get it done in his own way. The elastic man may have many a fall, but is seldom down long at a time. If he fails at one thing, or successfully accomplishes it, he soon takes up something else. The quality of hardness, softness, or elasticity, is readily noted when shaking hands. If the hand gives the impression of softness and yielding, the flesh in general will be found soft. An extremely hard unyielding hand is the hand of a hard person. And the springy, elastic hand is the hand of the elastic person.